Dubai: Former world number one Novak Djokovic will be looking to capitalise on his resurgent form to equal Pete Sampras’s record of 14 Grand Slams when he takes on Argentine Juan Martin del Potro in the US Open final on Sunday. The 31-year-old Serbian moved to within one Grand Slam triumph of American great Sampras after winning Wimbledon earlier in July — his first major since the 2016 French Open. After that success at Roland Garros, Djokovic went through a roller-coaster ride — thanks to upheaval in personal life and injuries — during a major part of 2017 and the early part this season. However, the father of two looked to be at his best while winning at Wimbledon a couple of months back and has continued that form at Flushing Meadows for the past two weeks. In the semi-finals, Djokovic outclassed 21st seed Kei Nishikori of Japan 6-3, 6-4, 6-2, while Del Potro will be competing in his first Grand Slam final for nine years after defending champion Nadal retired due to a knee problem. The 29-year-old third seed from Argentina was leading 7-6 (3), 6-2 when Nadal conceded after taking two medical timeouts. Should Djokovic beat Del Potro and equal Sampras, only Roger Federer (20) and Rafael Nadal (17) will stand above him in the all-time list of Grand Slam champions. Del Potro last competed in a Grand Slam final when he won at Flushing Meadows in 2009, ending Roger Federer’s 41-match winning streak in the process. He has since suffered a spate of injury problems, at times even contemplating retirement after having three operations on his wrist, before fighting back to his highest ranking this year. 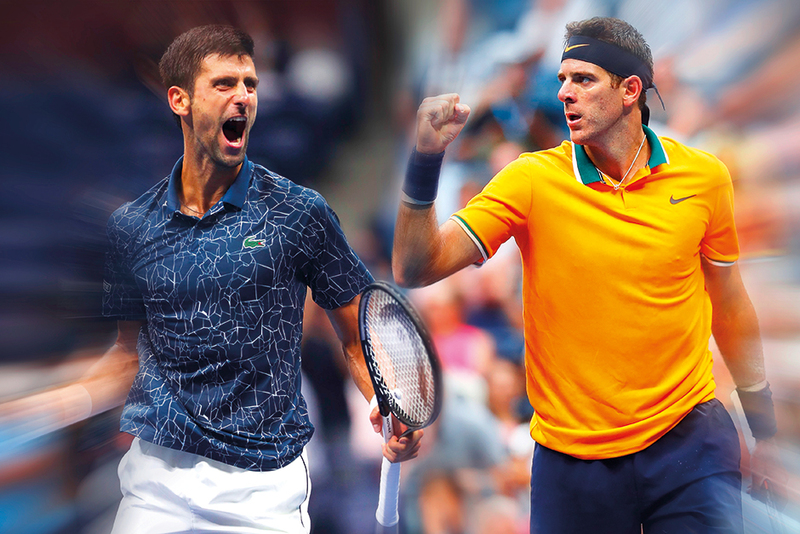 Friday’s victory was Del Potro’s first win in four Grand Slam semi-finals since beating Federer in 2009, having lost to Djokovic at Wimbledon 2013, then twice to Nadal at last year’s US Open and Wimbledon in July this year. Del Potro was thrilled at being in a major final yet again. “I didn’t expect to get this kind of emotions playing tennis again. Reaching finals, winning titles, having my highest ranking ever in this moment — everything is almost perfect,” the Argentine said after his win over Nadal. “This is not the best way to win a match. I love to play against Rafa because he is the biggest fighter in the sport. I don’t like to see him suffering like today. I am sad for him. I think the key to the match was the first set,” he said. After breezing through the first four rounds with identical 3-0 results, Del Potro’s real test came in his 6-7 (5), 6-3, 7-6 (4), 6-2 win against American John Isner in the quarter-finals. “I was close to quitting this sport because I couldn’t find a way to fix my wrist problems,” Del Potro recalled. “I have been suffering a lot. I got depressed for couple of months also,” he added. But on Sunday, the world number three will be in with an even chance of a second career Grand Slam. Djokovic, on the other hand, stuttered a bit in his first two rounds while dropping a set each against American Tennys Sandgren and Marton Fucsovics of Hungary, before powering away in straight sets in his next four. “We have never faced each other in a Grand Slam final so that will be new for both of us. I have tremendous respect for him as a player and a person. He has come back from injury and is well respected in the locker room. He is a big match player and he showed that against Nadal. I am sure it will be a thrilling match,” Djokovic predicted. “Being in the final means the world to me. I am trying to be the best that I can be. I am working hard every day and I am trying to reach certain heights that I visualise every time I accomplish something big. I don’t see any limits. I keep on going,” he added.